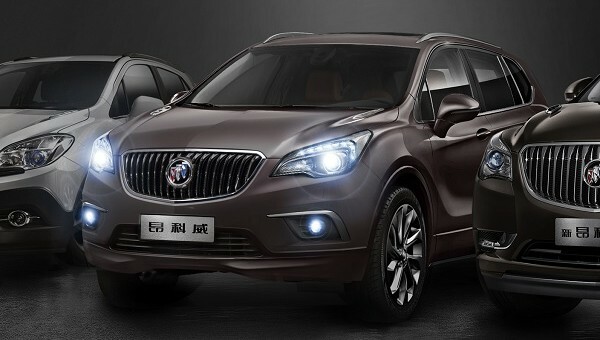 Buick gave us a preview of its new Envision midsize SUV for China yesterday. The SUV is perfectly in line with the brand’s styling-language but we also see some small Opel design hints, particularly in the bodylines on the side, the badge integration on the rear hatch and in the headlights. The design is perhaps best described as safe and conservative, which can make it attractive for some but a little unemotional for others. Out front on the Envision we see Buick’s waterfall grille, xenon headlamps with boomerang-shaped LED daytime running lights, two lower fog lights and vents on the hood similar to those on the compact Encore and full-size Enclave. Looking at the side reveals Opel-esque styling, which is no surprise as Buick described the car as having a “refined global design”. The SUV may also be part of General Motors’ plans to further align its Opel and Buick brands. Out back we see taillights which are reminiscent of those on other cars in the Opel lineup, which incorporate a chrome strip housing the Buick badge in the middle. There is also a narrow-looking back window and dual exhaust tips. We may eventually the Envision or a similar vehicles stateside, and Europe will almost definitely get the new crossover badged as an Opel. There is also talk of it making its way down to Australia as a replacement for the Holden Captiva. So if you’re not in China, there is still a good chance it will be coming to a dealer near you. Its styling is meant to please consumers the world over, so is it hot or not? Additional photos from the preview given to Chinese media can be seen here. The sooner this is available in North America, the better. I’d like to have that red white and blue Buick shield too. I agree with you about the Buick shield emblem. Strange they give it red white and blue in China but not here in the US, after all they are our colors. I sure hope this makes its way here too, the sooner the better IMO. I really like the design of the front of this, not so sure about the sweeping curve on the side like the Regal though. It looks good enough and it will sell well. It will hit the meat of the market. But, it has none of the snap from the concept car. Granted, there was no way that thing could be produced even close to the concept, but it didn’t have to get watered down quite this much. A bit too conservative, but it will find garages. I feel as though the lines do not flow enough on it. It seems like they put to many rough edges. The point of the new buick is to be nice, smooth, and flowing. Caddilac is the rough angled luxury group. I wish (before they bring it to America) they should go over it again. Right now this segment is hot and Buick CUV’s are selling well so it is a no brainer this will be here soon. The real question is if the SRX and Terrain are built in Springhill does that mean the Terrain will be larger as not to compete in the same dealer as the Buick? It would be smart marketing to enlarge the terrain a little and leave the Buick and Nox a little smaller to open the market up some more.